Images from the huge station showed scores of police trying to hold back protesters at the entrance. Great Northern tweeted: “Due to police dealing with an incident at Kings Cross access to the station is limited. National Rail said the station had been closed. Panicked passengers on social media said the scenes were like a "riot". Video footage at the scene showed some of the officers brandishing batons as crowds swarmed against them. 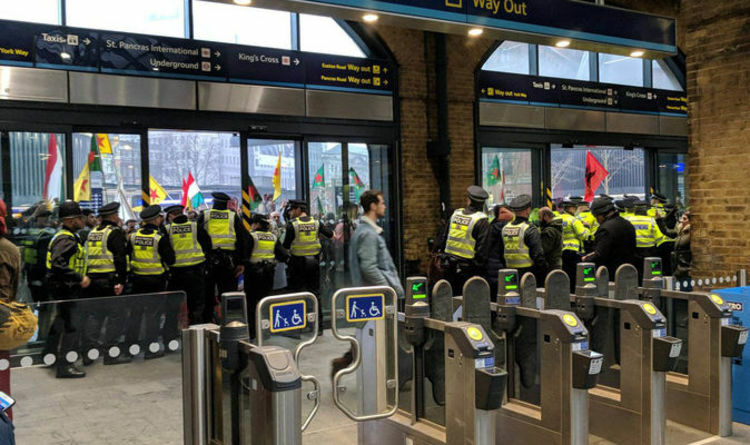 The incident came after Manchester Piccadilly station was closed by a similar protest this afternoon by Kurdish activists against Turkish military action in Syria. A group of activists made their way from the concourse at Manchester Piccadilly on to the tracks at around 1pm on Sunday. It resulted in services being halted, affecting customers across the country even after the protesters. Superintendent Mark Cleland from British Transport Police said: "While we appreciate and respect the right to peaceful protest, when this compromises the safety of the public and the protesters themselves, any offenders will attract the full investigative resources of BTP.